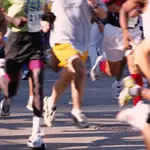 Because of the compressive forces and types of muscle contractions involved, running can be very hard on your body. If you are a large or heavy set person; harder still. If you plan on running long term, there are some basic rules that will keep you striding long term. 1. Take at least one or two rest days per week. This means no impact giving your joints a rest from the pounding forces that running produces. Less experienced runners may need two or thee rest days per week. Remember that you are weaker after a workout and only get stronger through proper recovery. Try to circumvent this process and injury becomes likely. He (or she) who recovers first wins. 2. Perform no more than one or two "break through" or high-intensity interval workouts per week. Speed work puts more stress and the body, and requires more recovery time. This type of work must be performed prescriptively and carefully. Try to schedule your speed work or interval workouts the day prior to a rest or recovery day. 3. Train in two- to three-day cycles, with a rest or recovery workout in between cycles. This allows your body to adapt to the stress of training. Some athletes will need more rest and less training, especially as intensity increases. A rest or recovery workout is best scheduled after an increase in weekly mileage. 4. Change your shoes out frequently. A good rule of thumb is at least three times per year for a high-volume runner. You may want to write the date you purchased your shoes in permanent ink on your shoes for reference. Buying shoes is expensive, but so is your insurance deductible. 5. Take the supplements Chrondroitin Sulfate and Glucosamine. I don't recommend a lot of supplements, but this combination has shown promise in clinical studies, and in control groups of people suffering from knee pain. One works as an anti-inflammatory (Chrondroitin); the other helps regenerate cartilage (Glucosamine). I know of several orthopedic surgeons who are recommending the supplement to their patients. It's definitely worth a try.